After 56 years of serving our clients, we’ve learned a few things. We understand our customers expect clean buildings. They want us to use common sense in our cleaning efforts. 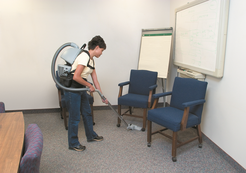 Office Cleaning in the Inland Empire is our core business! The result is a clean restroom that your employees will notice and appreciate! Trained employees, professional appearance and state of the art equipment make CEBM the right choice for your cleaning needs.